Casino games developer EGT specialise in pokies that feature colourful dice, and have a couple of games in their range where Joker characters appear, launching special features when they stop in the right places. 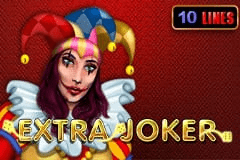 The Extra Joker video pokie is a good example of these games, and like the name suggests, there’s not one, but two Jokers popping up from time to time and awarding either the top payouts, or acting as an expanding wild symbol. Although Jokers are traditionally meant to be humorous, these both have a bit of a sinister look, with the male having an evil-looking grin on his face, and the female frankly looking like she’s dead. Scary stuff, but we’ll clam our nerves and get on with a review of how it all works and what players can expect to win as the 5 reels spin. Although it’s not packed with bonus features, there’s enough to lift it above the very basic format of just spinning the reels and seeing what happens when symbols line up, plus the Jackpot Cards progressive round and the optional gamble feature that all EGT pokies come with are both here. A simple red background, covered in a dice pattern sits behind the reels, and above them is the game title, along with the four levels of the progressive jackpot. Control buttons below the main game are used to set wagers from a minimum of 10 coins to a maximum of 100, and all 10 paylines are active at all times, so anyone wanting to just test it out will need to try the free Extra Joker video pokies that most casinos offer. A review of the paytable will explain the details of how this game works, and players will need to land 3 or more of the same type of dice across a payline on connected reels from the left side to get the majority of the winning combinations. The lowest-value of those dice are the light blue and pink ones, each of which returns wins of 10, 20 or 100 coins when landing on 3, 4 or 5 reels at a time, but the payouts steadily improve when the green and red dice appear. The dark blue and yellow dice are worth even more, as landing 3, 4 or 5 of these across a payline sees prizes of 20, 50 or 200 coins paid out, but the most valuable is the white dice covered in lucky number 8 as this returns 50, 200 or 500 coins. Lastly, there’s the creepy male Joker symbol, who’s worth 100, 500 or the best payout in normal play of 1000 coins. The only symbol left is the female Joker, who may look kind of weird, but she helps players to land additional wins when she turns up on any of the middle 3 reels. This symbol will first become an expanding wild, filling the entire reel or reels that she’s appeared on, and will act as any other to help complete winning combinations, or extend a line of 3 matching symbols across to reel 4. Once she’s done this, and players have been paid out for any new lines completed, the wild stays locked in place and any remaining reels will respin just once, potentially creating a whole new set of winning lines. If players get a win of 350 coins or less, they are given the option to play a 50/50 gamble game, doubling the prize when they correctly guess if a playing card will be from a red or black suit, but losing it for a wrong pick. There’s a further option to try and double it again and again if they keep getting it right, but of course, losing the lot for a wrong pick at any stage. This randomly-triggered mini game can bring players a small fortune as there are 4 progressive jackpots, each linked to a card suit and they are guaranteed to win one of them once it starts. 12 playing cards are shown face-down, and the first suit found 3 times as they are clicked on will see the corresponding jackpot awarded. Values range from the smallish Club prize to the high limit Spade jackpot, which can be pretty substantial. Despite the main characters being enough to give small children nightmares, hopefully anyone old enough to be playing online casino pokie machines won’t be put off, as it’s a quality game where main bonus feature may be simple, but it’s very effective. Getting a win from the expanding wild and reels respin isn’t guaranteed, it seems to be a reliable feature where payouts occur most times.